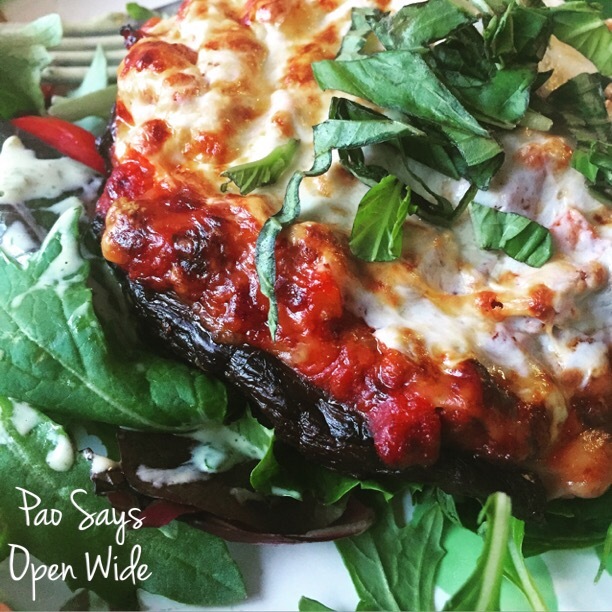 Easy and Cheesy: Lasagna Portobello Caps – Pao Says, "Open Wide!" This past weekend was one of my closest friends, Mary’s, bachelorette party. She decided to have her celebration weekend here, in DC, so all of us former college roommates were able to reunite in the city that brought us together. The weekend was incredible and I can’t wait to see this group of girls again in a few short weeks for Mary’s wedding! I was lucky enough to be able to have the girls over to my place for dinner one night. I made one of the classic meals I used to cook for our “family dinner” nights: spaghetti alla bolognese. Now, when I make bolognese, I like to make a ton of it so I can freeze it and keep eating it for days 😈. For dinner tonight, I grabbed a baggie of the meaty bolognese sauce and decided to make a healthy take on lasagna. Depending on the size mushrooms you get, these lasagna portobello caps can fill you up! Even Ryan was full after one! I love this recipe because it’s super easy, and it’s a great use of left-overs. Preheat your oven to 400 degrees F (about 200 C). Scoop out the gills from the portobello mushroom caps- careful not to tear the mushrooms. Brush all sides of the portobellos with the spicy garlic olive oil mix. Add about 1/4 cup of ricotta cheese inside the portobello mushroom. Layer 3 basil leaves over the ricotta. Scoop bolognese into the caps until they are full. Top with mozzarella rounds and Parmesan. Drizzle olive oil over the top. Bake for 15-20 minutes (until cheese is bubbly and browning).